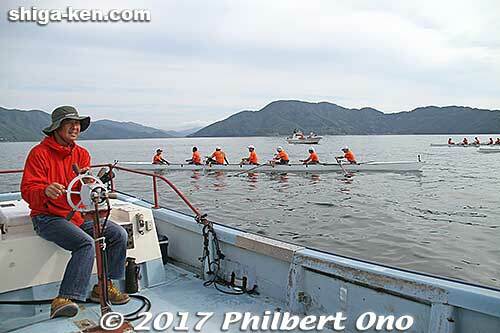 Biwako Shuko no Uta (Lake Biwa Rowing Song) was created in June 1917 by rowing club members (especially Oguchi Taro) at an old elite university called Daisan Koto Gakko (No. 3 High School, nicknamed “Daisanko” or “Sanko” 三高) which merged with Kyoto University in 1949. 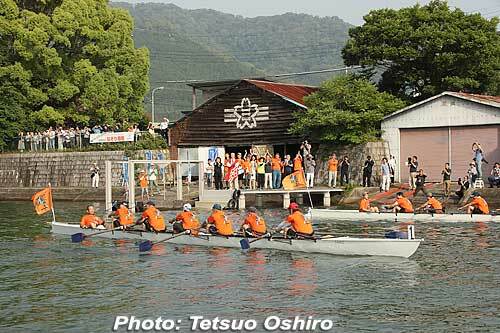 Kyoto University has since adopted the legacy of Sanko by absorbing the Sanko campus (now the Yoshida-South Campus right across from the Main Campus), the rowing club, and adopting Biwako Shuko no Uta as one of the university’s official songs. 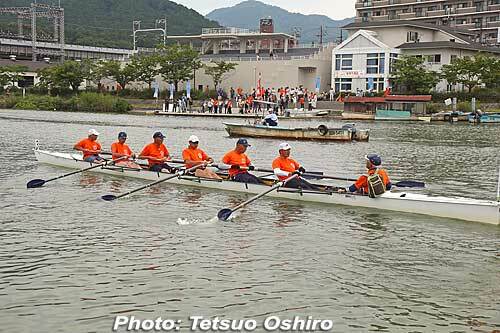 The Kyoto University Rowing Club (KURC) has a very active and dedicated alumni association called Noseikai (濃青会), which means “Dark Blue Association,” named after the rowing club’s official color of dark blue. 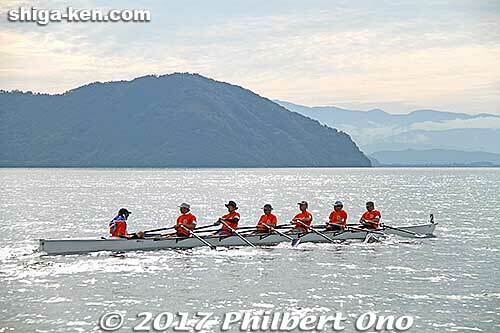 (Their oar blades are dark blue.) 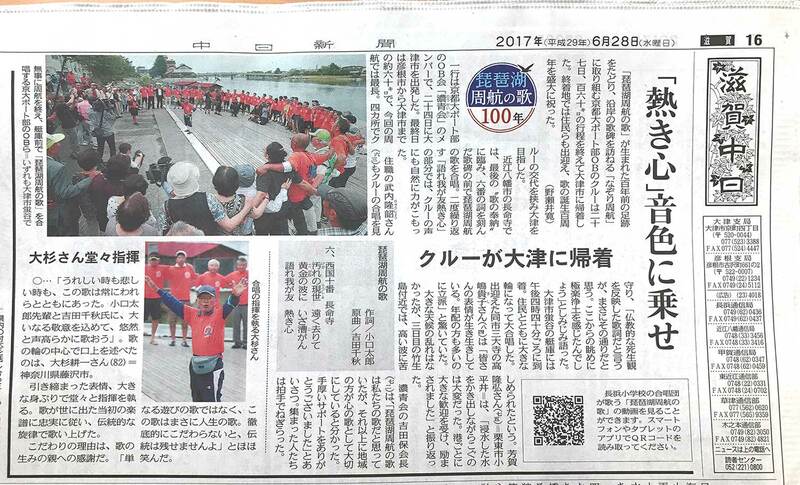 This association spearheaded the planning and execution of the university’s celebration of the song’s 100th anniversary and also greatly helped with Shiga’s 100th anniversary song celebration in June 2017 which included a four-day rowing excursion around Lake Biwa by KURC alumni. They also helped to raise funds to build a new song monument on campus. 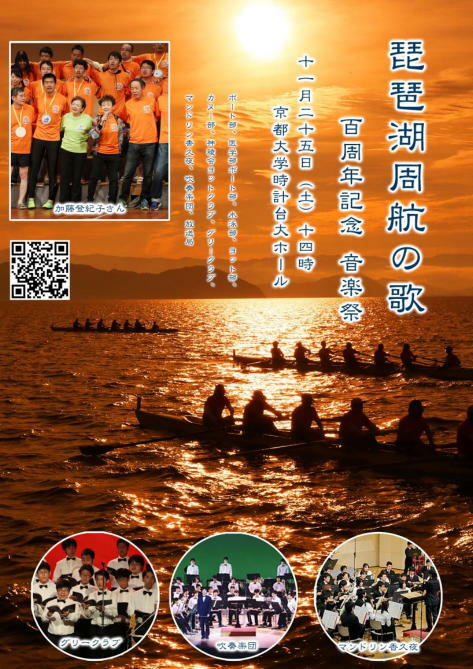 Much of the fund-raising was done by the university’s water sports clubs (rowing, yachting, canoeing, and swimming). If you don’t have time to watch the video, you can continue reading to see photos instead. Links to the respective video footage are also provided below. 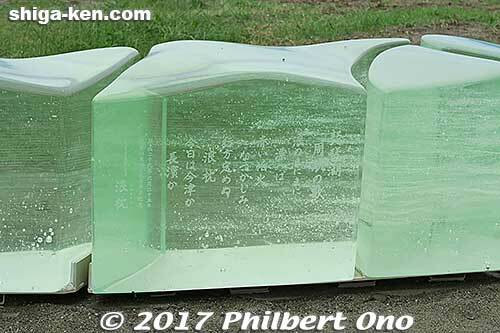 Front side of the new Biwako Shuko no Uta song monument at Kyoto University. 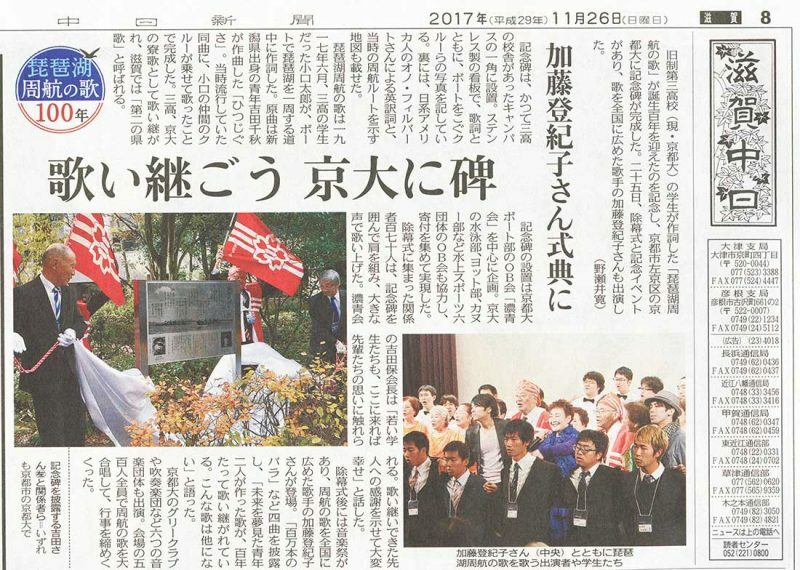 Kyoto University’s 100th anniversary celebration of Biwako Shuko no Uta started with the unveiling of a new song monument on the Yoshida-South Campus (the former Sanko campus) at 11:00 a.m. on November 25, 2017. (Video here.) This campus is right across the road from the main campus (and main gate). (See map and directions below.) Built to commemorate the song’s 100th anniversary, the new song monument is a beautiful, double-sided, stainless-steel panel with a brushed-metal finish. Daisan Koto Gakko (No. 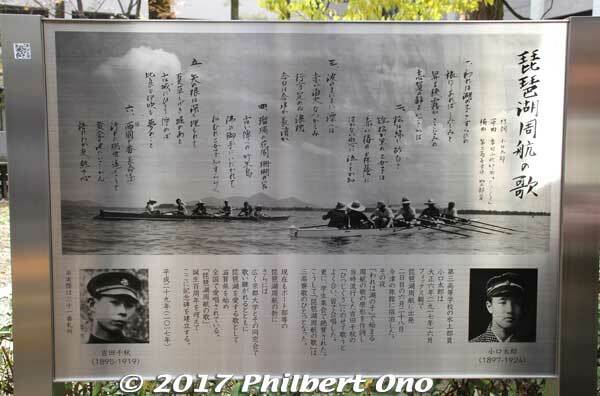 3 High School) rowing club member Oguchi Taro left in June 1917 (Taisho 6) on a fixed-seat boat to row around Lake Biwa. On the second day on June 28, they stayed at a ryokan in Imazu. 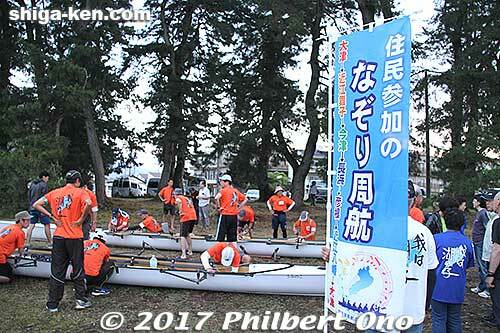 That evening, he composed a draft of a rowing song that started with “Ware wa Umi no ko” (We’re children of the lake). They sang it to the melody of Hitsuji-gusa (Water Lilies), a popular song at the time composed by Yoshida Chiaki. The melody matched the song well and they sang it together. The song was well received at student gatherings. 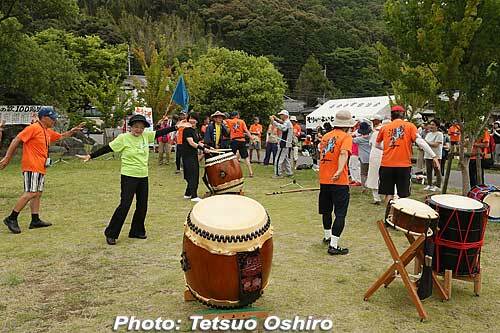 This is how Biwako Shuko no Uta became a college dormitory song of Sanko (Daisan Koto Gakko). Today, the song continues to be sung by the university’s rowing club when they row around Lake Biwa and by many people at Kyoto University and class reunions. 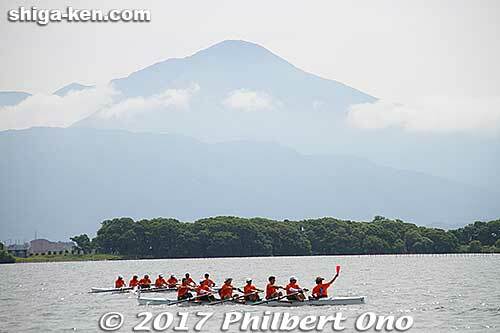 Also, as a song expressing affection for Lake Biwa, the song is lovingly sung by people in Shiga Prefecture and across Japan. 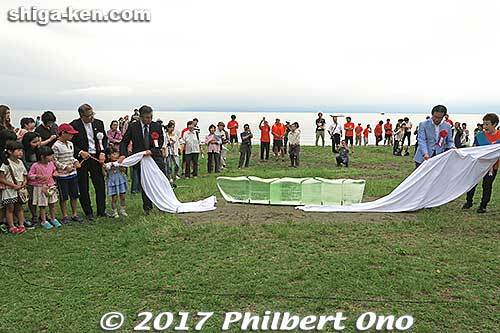 To mark the 100th anniversary of Biwako Shuko no Uta, we built this monument here. From the late 19th century, dormitories at Japan’s elite universities started a tradition of creating their own “dormitory songs” to be performed at their annual dormitory festivals. 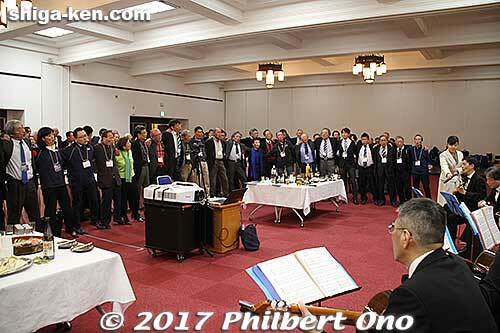 Dormitory boarders sang the song together at dormitory festivals and student gatherings. While most of these songs fell into obscurity, some dormitory songs like Biwako Shuko no Uta continue to be sung. 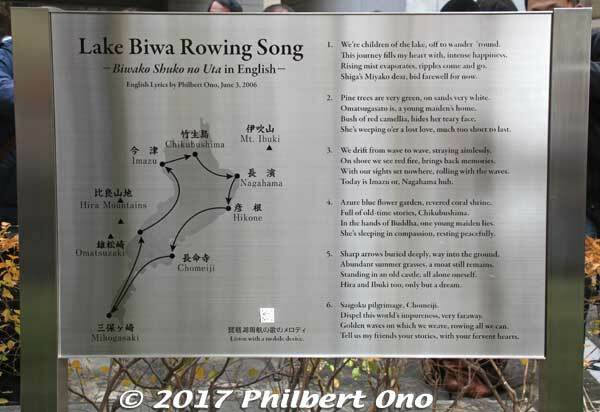 The rear side of the song monument shows a bilingual Lake Biwa map of the rowing route taken by Oguchi and his rowing mates in June 1917 and my Lake Biwa Rowing Song English lyrics (all six verses). 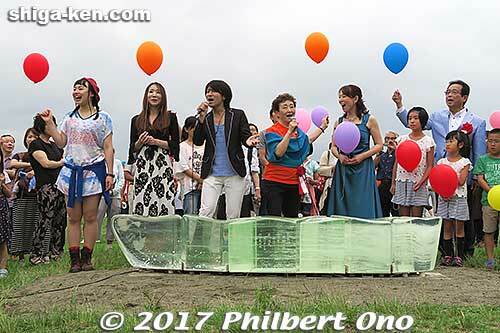 Members of the KURC alumni association (Noseikai) initially proposed building this song monument for the song’s 100th anniversary. There were already song monuments in Shiga and Okaya, Nagano Prefecture, but none at Kyoto University. So they thought the university should also have a monument. The university agreed to have the song monument on campus, but it required the monument to also include English lyrics. At first, the alumni association wondered where they could obtain English lyrics, but they soon found my English version of the song. They contacted me in 2016 and asked for my permission to use my English lyrics. I said, “YES, YES!! Please do so! !” “You can use it for free! No charge! !” And so they did. Kyoto University has been pushing to become more international and more attractive for international students. So they wanted a monument that international students could also understand. I was very impressed to hear this. A song monument in Japan with both Japanese and English lyrics must be extremely rare. I haven’t seen one until now. 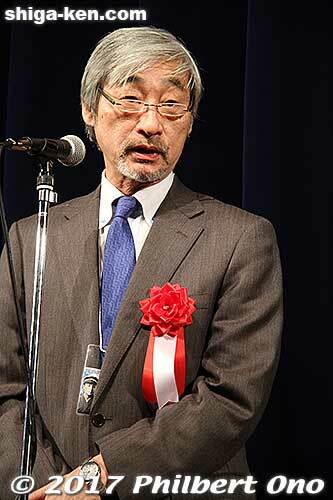 The current Kyoto University President is Yamagiwa Juichi who speaks English. He has traveled the world to study primates and gorillas as a way to learn more about early humans and their evolution. So he’s very internationally oriented. Having someone at the top with an international outlook helps a lot. I’m certainly very honored and delighted to see my English lyrics on a monument. Monuments are usually built to point out something (or someone) that is important. So monuments naturally attract people’s attention. It’s important for a monument to be easy to read and in a good location where people can see it. This new monument meets both of these conditions. 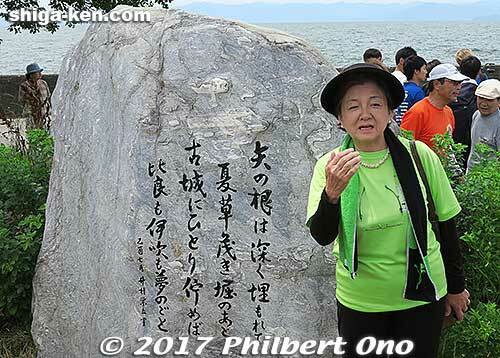 It was the Verse 1 song monument in Mihogasaki, Otsu that first piqued the interest of Iida Tadayoshi, the foremost song researcher (since 1974) who has written a few books about Biwako Shuko no Uta. And I also first learned about the song when I saw a statue of composer Oguchi Taro and a song monument in Okaya, Nagano Prefecture. So song monuments can be very worthy to have. I wonder if there’s any other song in Japan that has this many monuments for it in three prefectures. 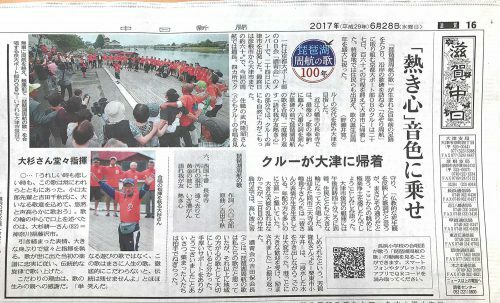 I’m very hopeful that this new monument will pique the interest of both Japanese and non-Japanese students in the song and in Shiga. 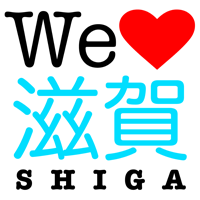 I believe the song’s story, background, melody, and vivid depiction of Shiga can fascinate any young mind. 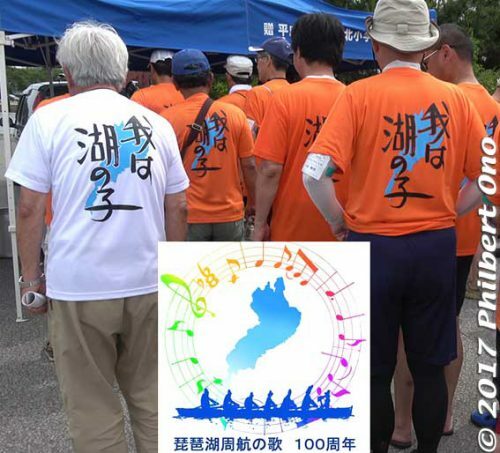 The monument also has a QR code that you can scan with your mobile device to access the rowing club’s official 100th song anniversary website where you can learn more about the song and watch song videos in both Japanese and English. Here’s a map of the exact location of the new song monument (and the other song monuments). Zoom in on Kyoto. From JR Kyoto Station, get out the Karasuma exit (Kyoto Tower side) and go to Bus Stop D2 to board bus No. 206 bound for Kitaoji Bus Terminal. Get off at Kyodai Seimon-mae (京大正門前). The ride takes about 35 min. The main campus will be across the street from the bus stop, and the entrance to the Yoshida-South Campus is across the road facing the main campus. After the unveiling of the song monument, we had lunch and moved to the Kyoto University Clock Tower Centennial Hall for an hour-long Lecture Session (including performances by the Kyoto University Glee Club) starting at 12:30 pm. 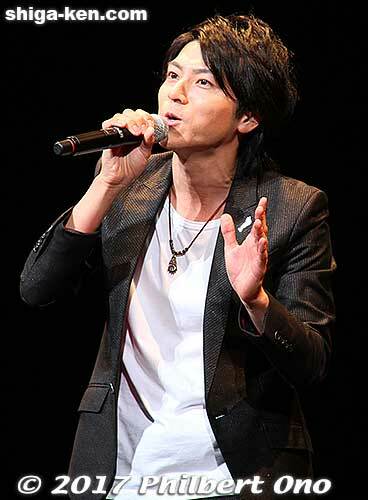 The main speaker was song researcher Iida Tadayoshi. He is the foremost authority on the song. A lot of what we know about the song and the composers is due to his research. 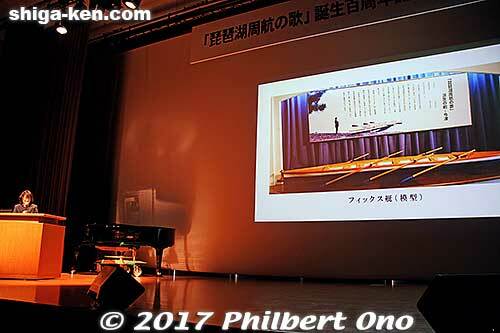 He talked about how the song was created by Oguchi Taro and how the Hitsuji-gusa melody by Yoshida Chiaki was adapted to it. 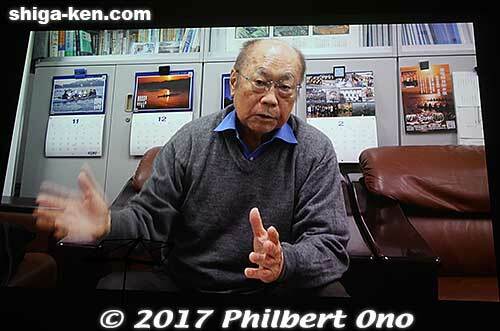 Due to health reasons, Iida sensei was unable to appear in person so he appeared in a video lecture. Video here. 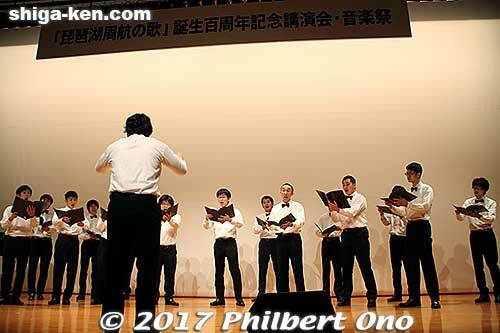 After his lecture, the Kyoto University Glee Club sang Hitsuji-gusa (Verse 1) composed by Yoshida Chiaki and Nara no Miyako (Verse 1) which was the song whose melody Oguchi originally considered using for Biwako Shuko no Uta. Video here. Video message from Jamie and Megan Thompson. I was the second speaker, taking about 10 min. to mainly show slides of people who helped and encouraged me before and after I finished writing the English lyrics. 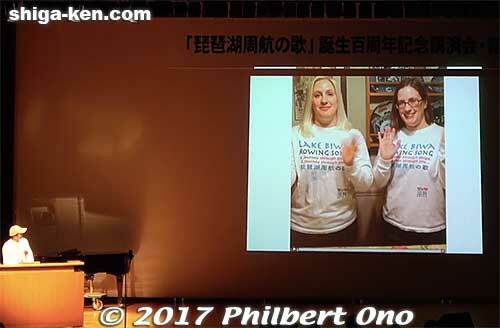 Since Jamie and Megan Thompson (who sang Lake Biwa Rowing Song) could not make it to Japan in Nov., I showed a one-minute video message in Japanese from them. Video here. 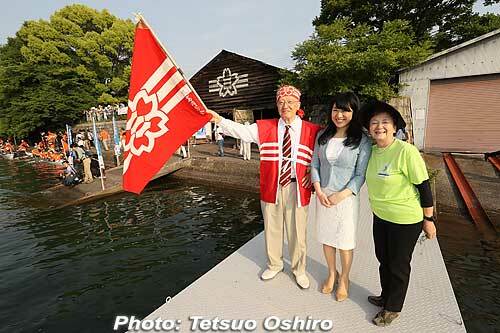 Murai Yoshiko talked about the Biwako Shuko no Uta Shiryokan. 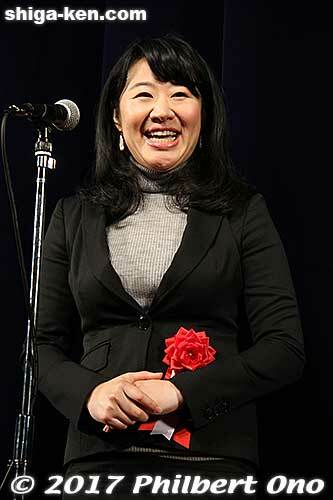 The third and last speaker was Murai Yoshiko, the director of the Biwako Shuko no Uta Shiryokan song museum in Imazu. 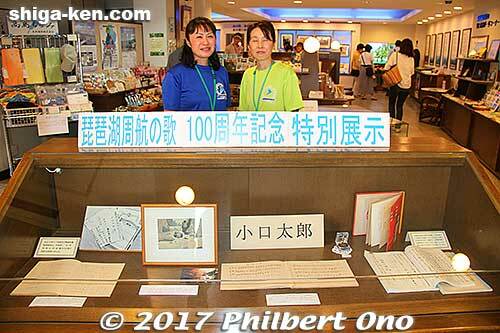 She used slides to explain about the museum near JR Omi-Imazu Station and encouraged everyone to visit. Video here. After a 30-min. 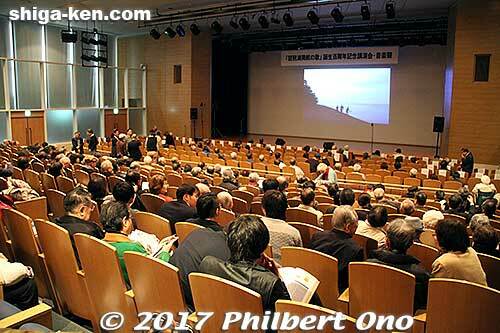 break, the Music Festival (Ongakusai) started at 2:00 p.m. in the same Clock Tower Centennial Hall (capacity 500) as the Lecture Session. 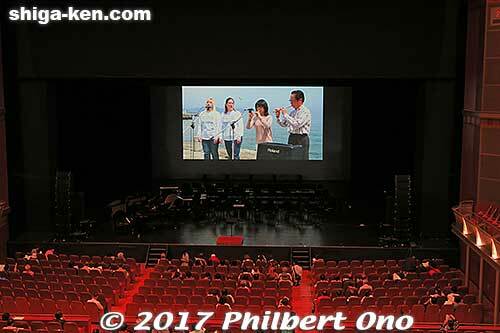 Part 1 had the Kyoto University Symphonic Band, Kyoto University Glee Club, Himawari Choir (from Otsu), and Mandolin Guitar Ensemble Kaguya perform or sing Biwako Shuko no Uta and a few other songs. Part 2 featured a 40-min. 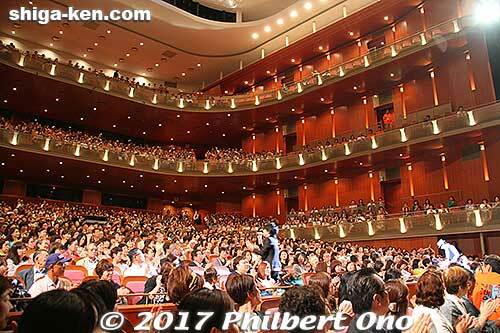 talk show by singer Kato Tokiko. 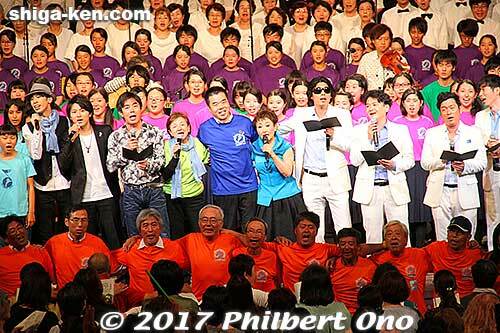 The finale had all the performers appear on stage to sing Biwako Shuko no Uta together with the entire audience. 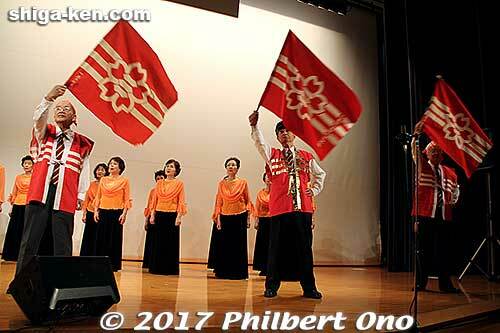 The finale was led by Kato Tokiko and the music festival ended at 4:30 pm. 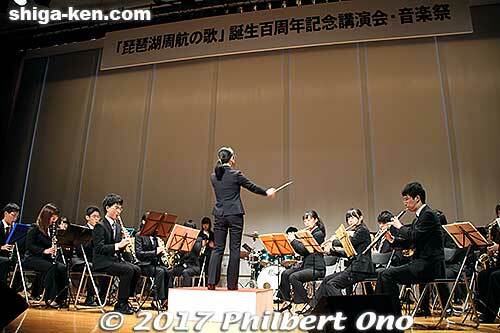 Kyoto University Symphonic Band opened the music festival with Fanfare and played Biwako Shuko no Uta. 京都大学吹奏楽団 Video here. 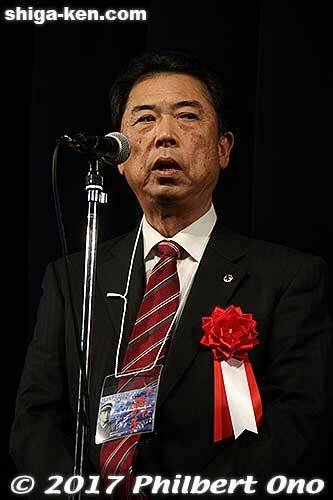 Shinsuke Kawazoe, Kyoto University Executive Vice-President (substituting for Kyoto University President Juichi Yamagiwa). 川添信介 京都大学理事・副学長（山極壽一総長の代理）Video here. 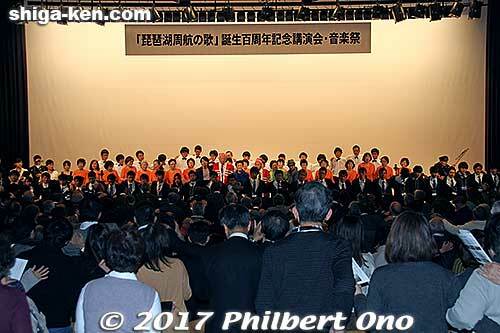 Otsu Mayor Koshi Naomi mentioned that Otsu City Hall plays the song to signal the end of the work day, resulting in a decrease of overtime by almost 30%. Video here. 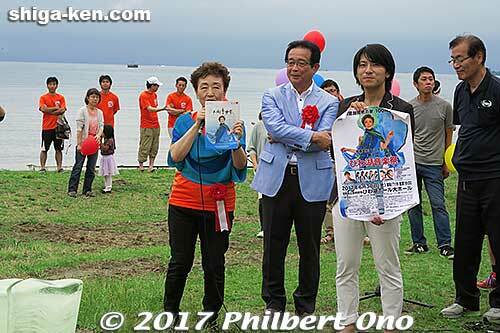 Shoshichiro Hiraoka, Deputy Mayor of Takashima (substituting for Mayor Masaaki Fukui), promised to perpetuate the song to the next generation. Video here. 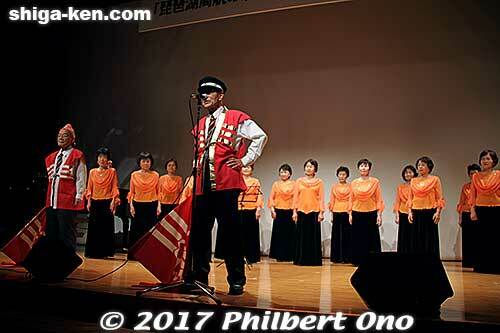 Sanko alumni sing with Himawari Choir from Otsu. 旧制第三高等学校OB + 大津市ひまわり合唱団 Video here. 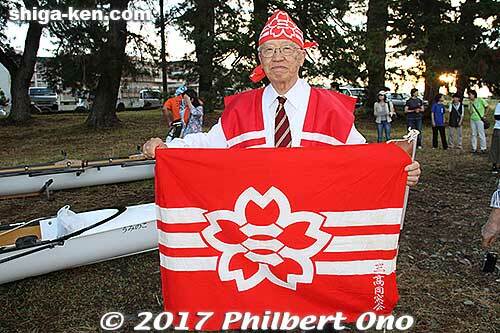 Sanko alumni wave their school flag. The Sanko logo has a cherry blossom with three stripes. 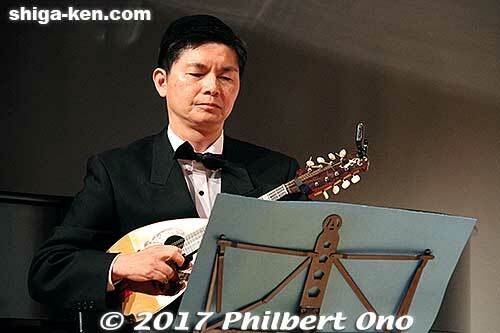 Mandolin Guitar Ensemble Kaguya. マンドリンギターアンサンブル香久夜 Video here. Mandolin Guitar Ensemble Kaguya. Great performance. 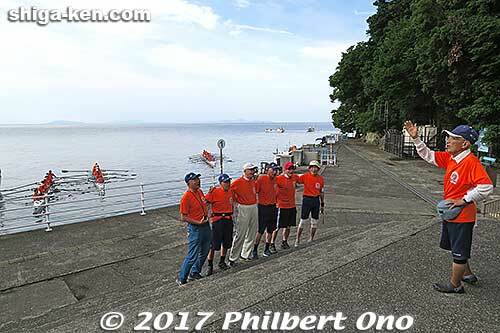 Kyoto University Glee Club sang What Shall We Do With The Drunken Sailor (video here) and Biwako Shuko no Uta (video here). 京都大学グリークラブ . A short break after Part 1. 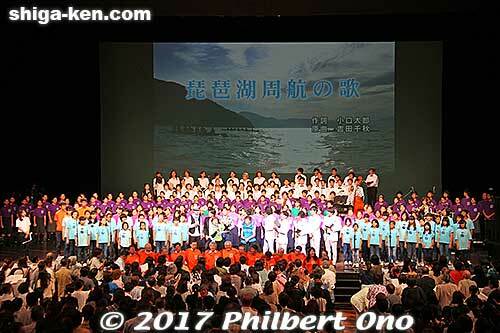 Led by Kato Tokiko, everyone sang Biwako Shuko no Uta in the end. Video here. 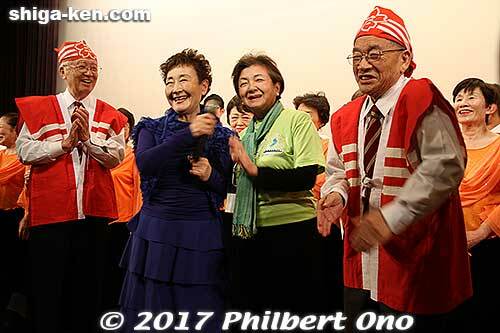 Singer Kato Tokiko and Kada Yukiko on stage during the finale. After the music festival, attendees had the option to attend the party from 5:00 pm to 7:00 pm on the 2nd floor of the Clock Tower Centennial Hall. This was when we could finally mix and socialize. 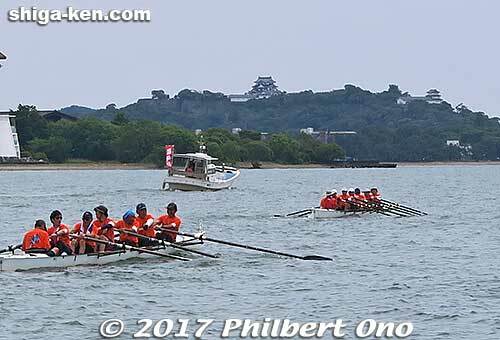 It was nice meeting and talking with people from Oguchi Taro’s hometown and Yoshida Chiaki’s hometown and rowing club alumni. Very few women though. 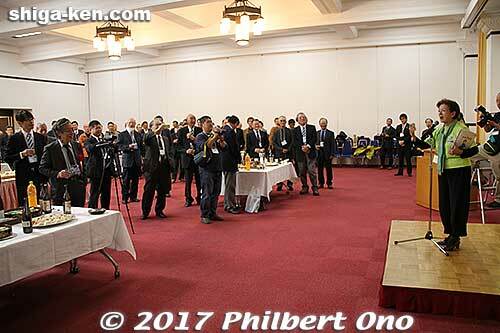 Kada Yukiko gave a short speech at the start of the party. 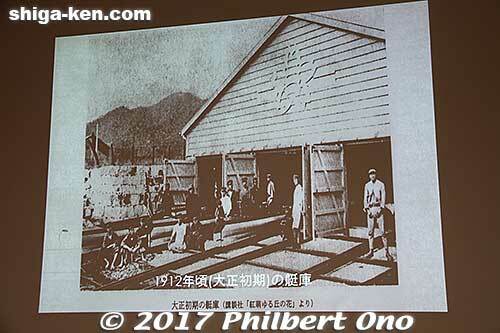 Yacht Club showed slides of KURC’s original boat house in Otsu. 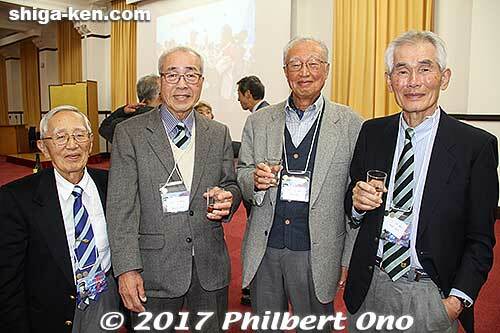 Kyoto University Rowing Club alumni. 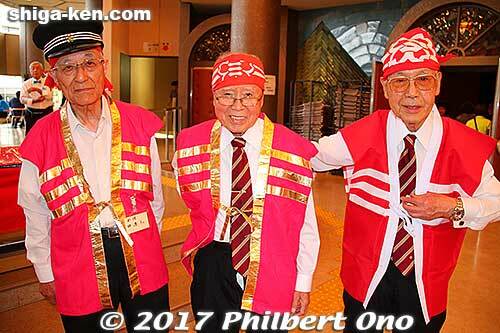 These three tall men almost represented Japan at the 1956 Summer Olympics in Melbourne. 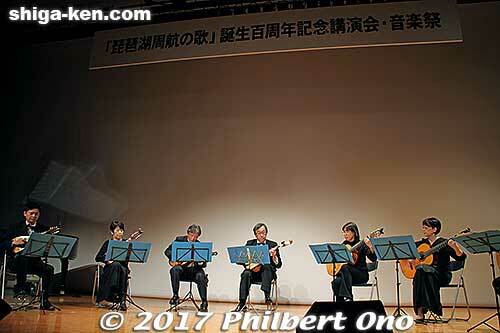 In the end, everyone sang the song with Mandolin Guitar Ensemble Kaguya. 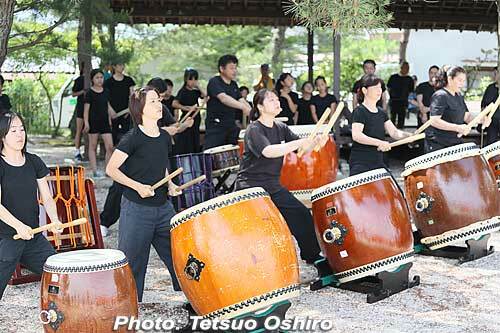 The celebrations of Biwako Shuko no Uta’s 100th anniversary in Shiga and Kyoto were quite spectacular. 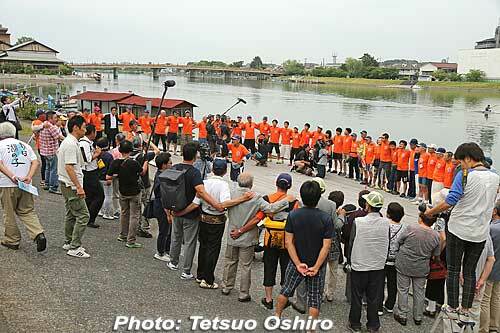 It has spread awareness of the song as a precious hometown asset. 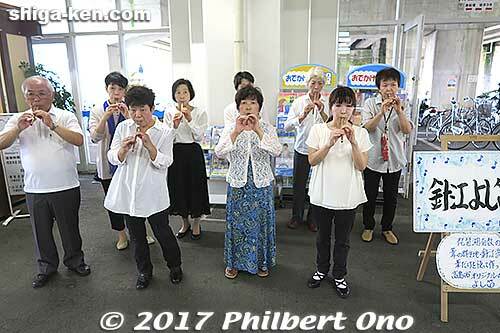 Shiga has so few famous hometown songs, and even its most famous one is in danger of being forgotten since it’s not really taught in schools. Where I come from, there are many, many beloved Hawaiian songs (and dances) that continue to be sung for generations. I cannot imagine growing up in a place that lacks popular hometown songs. It shapes your identity and affinity with your hometown. 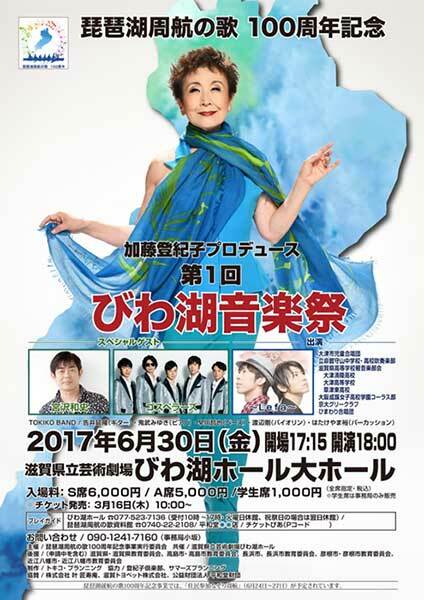 It would be a major cultural loss if Shiga allowed Biwako Shuko no Uta to fall into obscurity. It is by far Shiga’s most nationally famous song. It’s comforting to see more people singing the song in Japanese or English. They are posting on YouTube. Anyone is welcome to sing the song in Japanese or English. I still wish John Denver lived long enough to record it. His voice matches the song extremely well. Thank you to everyone who made the 100th anniversary celebration a great success. The Rio de Janeiro Summer Olympics in Brazil will be held on August 5–21, 2016 (Paralympics on Sept. 7–18). 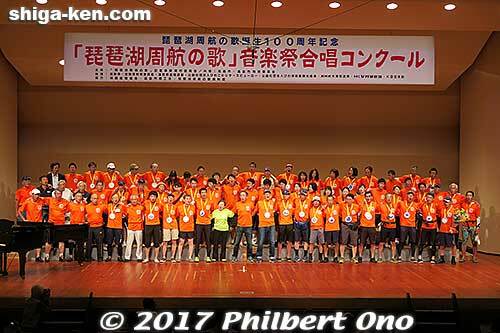 Out of 300+ Olympic athletes from Japan, the following Olympians are from Shiga Prefecture. To see when they will appear, click on “Olympic schedule” (NBC website). 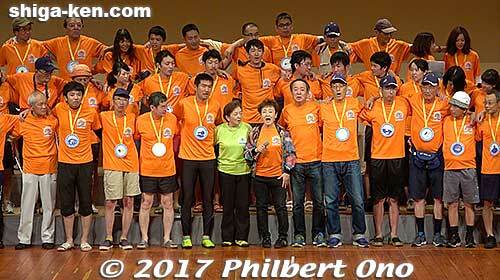 This link will also give the athlete’s results as they come in. Kiryu (b. 1995) is one of Japan’s major track stars and native of Hikone, Shiga Prefecture. A top-notch sprinter since 2013. He’s often in the news. Started running from when he attended Minami Junior High School in Hikone. His record time in the 100 m is 10.01 sec. and 9.87 sec. His track mates like Aska CAMBRIDGE are also awesome runners and it’s impossible to say who will prevail in Rio. 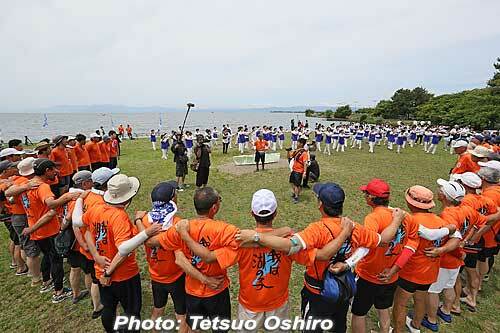 Hailing from Otsu, Ota (b. 1985) won the national fencing championship while in elementary school and junior high. He went on to win the national high school championships (Inter-High School Championship) three years in a row. Graduated from Doshisha University. At the Beijing Olympics in 2008, he became the first Japanese to make it to the finals in fencing and brought home a silver medal. He gained national attention for winning the team silver medal at London. Then in Sept. 2013, he was in the spotlight again as a member of the JOC trying to get the 2020 Olympics to Tokyo. When “Tokyo 2020” was announced, his joyful face made national headlines. At the 2015 World Fencing Championships, he won the gold medal in the Men’s foil event. Ota is ranked No. 1 in the world as of the 2015-16 season. 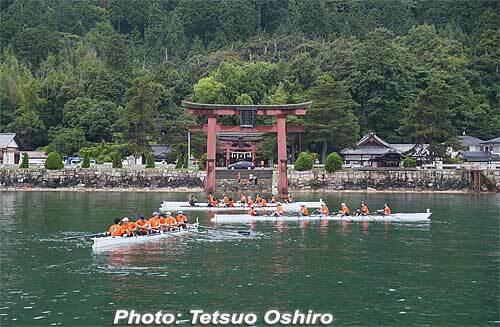 Three members of the Otsu-based Toray Arrows women’s volleyball team will be in Rio. Both Kimura (b. 1986) and Sakoda (b. 1987) played in the London Olympics where they won the bronze medal. Tashiro (b. 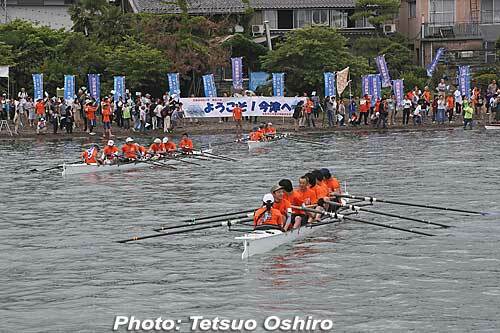 1991) is from Ritto, Shiga. Influenced by her mom who played, she started playing volleyball from 1st grade and joined Toray Arrows in 2009. Meanwhile, the 185 cm-tall Kimura will be the national team’s captain in Rio. She will be the first Japanese volleyball player to play in four consecutive Olympic games. A real veteran and major volleyball star. The Japan women’s national volleyball team (Hinotori Nippon, 火の鳥NIPPON) is currently ranked 5th in the world. The Toray Arrows belong to the V.Premier League, Japan’s top volleyball league. 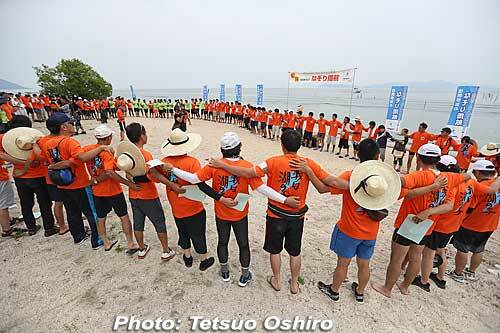 The team is owned by Toray Industries, a major textile maker with factories in Shiga. Their home court is Toray Arena in Otsu. Inui Yukiko (b. 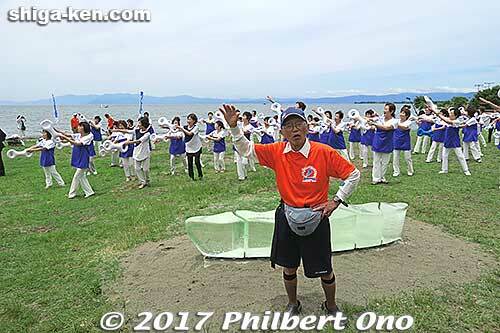 1990) is an Omi-Hachiman native who started synchronized swimming from the 1st grade. At age 16, she placed 3rd in the solo competition at the Junior World Championships. Graduated from Omi Kyodaisha High School in Omi-Hachiman and Ritsumeikan University. Together with her duet partner KOBAYASHI Chisa (小林千紗), she won the national championship for duet synchronized swimming in 2009 and placed 3rd in the World Cup in 2010. The pair competed together in the 2012 London Olympics and placed 5th. Wish her luck in Rio for a medal. Ayaka and Minami (Photo: Maibara website). Ayaka (b. 1989) is from Maibara (Ibuki). Yay! She started playing hockey after seeing her older brother and sister play. (Maibara is a hockey hotbed.) She has been playing for the Hiroshima-based Coca-Cola West Red Sparks hockey team since 2012. She appeared in the 2015 World League semi-finals. There’s not one, but two Olympian women hockey players from Maibara. And both are from Ibuki. How about that. I’ve heard that the folks in Ibuki are making a big deal out of this. Minami (b. 1993) graduated from Ibuki High School and plays for the Sony HC BRAVIA Ladies hockey team based in Inazawa, Aichi Prefecture. She’s actually one of nine players from Sony HC BRAVIA going to Rio to play on Japan’s women’s hockey team (dubbed “Sakura Japan”). Her position is FW. What a thrill it must be for both of them to be in Rio. Something that will bond them for the rest of their lives. Charming girl (b. 1987) from Takashima, Shiga Prefecture. 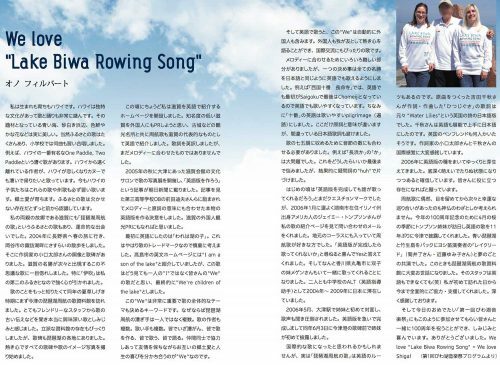 The kanji character for her first name is pronounced “Megumi” instead of “Ai.” Interesting that her father ran a windsurfing shop in Takashima so she was exposed to the sport since childhood. But ironically, she didn’t care for it until she went to college. 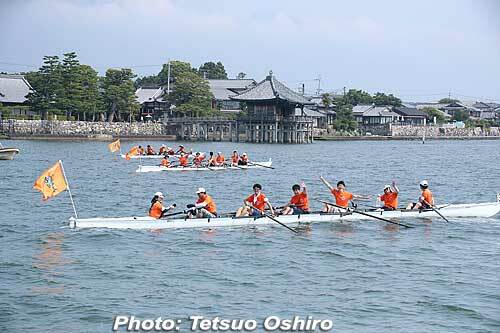 While at Doshisha University, she won the All Japan collegiate championship. She qualified for the Rio Olympics by placing 21st at the 2015 RS:X World Windsurfing Championships held in Oman. 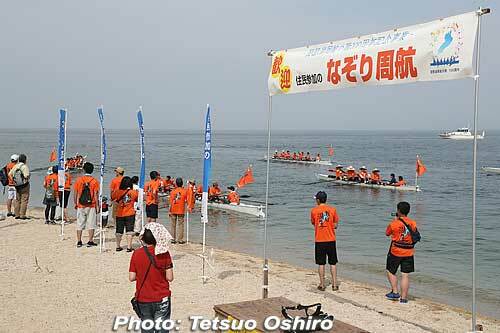 She always practiced windsurfing on Lake Biwa and wants to promote windsurfing at Biwako. 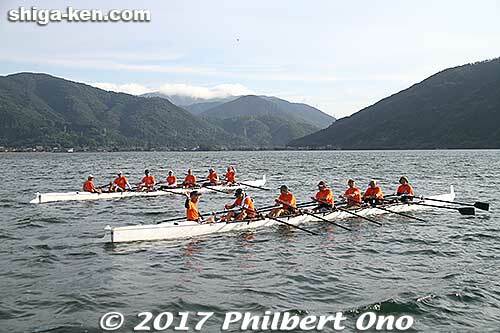 While practicing in Rio in July, a school of dolphins surprised (welcomed?) her. Native of Otsu, Kazuno (b. 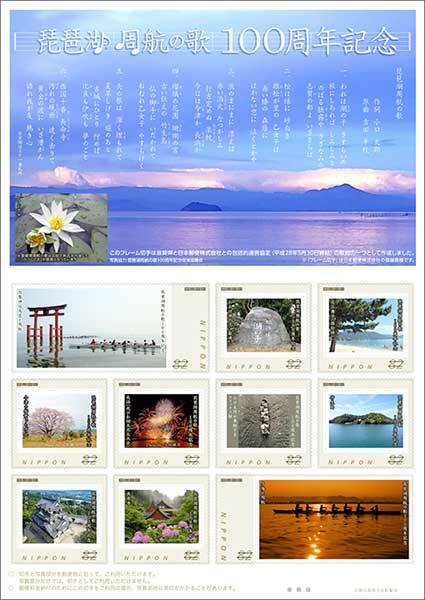 1985) attended Hie-zan High School and Nihon Univ. He specializes in badminton doubles. Joined UNYSIS in 2008. He won the mixed doubles at the 2015 All Japan Championships. He also won the Osaka International Challenge doubles three times in a row, won the Polish Open Men’s Doubles in 2015 (with Yamada Kazushi), and won the Malaysia Masters Men’s Doubles (with Yamada Kazushi). He is the captain of Japan’s badminton team in Rio. Let’s see if he can continue his winning streak in Rio. Another badminton Olympian from Otsu. Hayakawa (b. 1986) has been playing badminton since elementary school. Attended Hie-zan High School and Nihon Univ. Like Kazuno Kenta, he belongs to UNYSIS and specializes in badminton doubles. Men’s doubles runner-up (with Endo Hiroyuki) at the 2016 All England Super Series Premier. 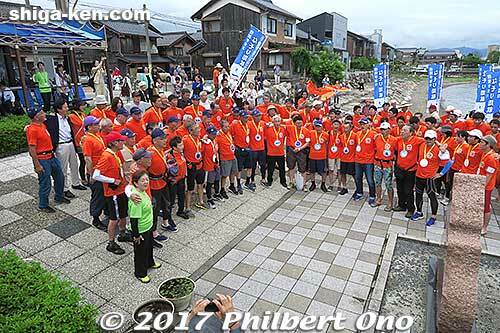 *Marathon runner KITAJIMA Hisanori (北島寿典) was born in Koka, Shiga, but moved to Maebashi, Gunma as an infant. Born in Ritto in 1990, Keiichi has been totally blind since age 2. From 4th grade, he took up swimming. He made the Japanese Olympic team in Beijing in 2008 and in London 2012. In London, he won the silver medal for the 100 m breaststroke and bronze for the 100 m butterfly. Rio will be his third consecutive Paralympics. 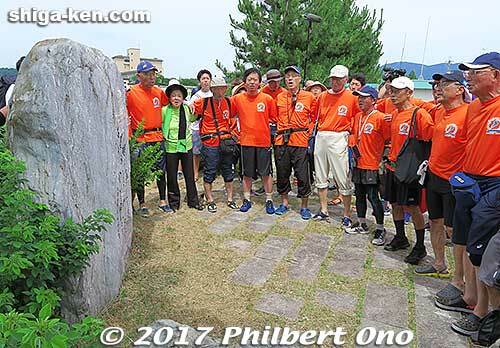 Last but not least is an amazing story and struggle behind 58-year-old Miyaji Mitsuhide joining the Paralympics for the first time. 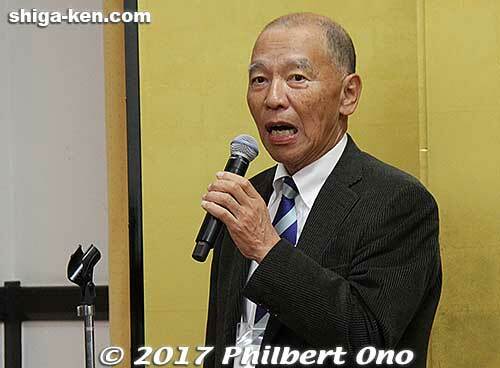 Originally from Kagoshima, Miyaji is a former race horse trainer at the Ritto Training Center and lives in Konan. In 2005, he suffered a stroke that paralyzed his right side and affected his speech. As part of his rehabilitation, he took up equestrian activities. 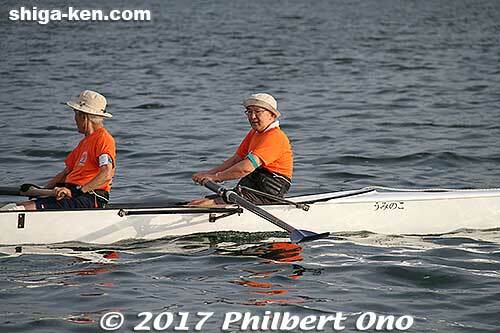 With much struggle and support from his wife, he got good enough to enter the Rio Paralympics. GOOD LUCK to all the athletes in Rio! !